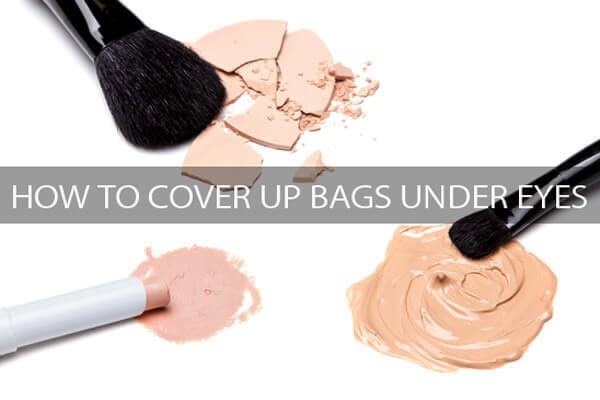 Bags, dark circles… We have all tried to cover them up and sometimes it feels as though nothing will do the trick. Ask a dermatologist and he/she will tell you that the easiest and most effective way to get rid of bags under eyes is to have filler injections such as Juvederm and Restylane, or getting an eye lift through cosmetic surgery. But what are you supposed to do if you can’t afford those treatments or would simply prefer using non invasive methods? If you are a scaredy cat like me when it comes to anything that involves needles and being put under sedation, don’t worry: there are other ways to tackle these unwanted bags. There are many factors that can cause dark circles and bags under eyes. Here are the most common ones. Heredity is a big factor. If one of your parents have noticeable puffiness around the eyes, chances are you will inherit this condition around the same age. Age is also a main factor. When we get older, the delicate skin around our eyes loses its firmness. Some of the muscles around our eyes also weaken resulting in some of the fat moving down into the lower eyelids, thus causing our eyes to look droopy and puffy. The older you get, the more exposure you have had to gravity and therefore, the more sagging will occur. Salt can play a major role in worsening bags under eyes and dark circles. Bags are pockets of fluid that have accumulated and created swelling. Just like your body retains water when you eat too much salt, so does your face. If puffy eyes are something you have recently noticed, you might want to look at your diet and keep track of your daily sodium intake. Fluid retention can also happened with the change in weather (if it suddenly becomes humid or hot) or if you are going undergoing hormonal changes (it could also be thyroid related). I have allergies and boy can they mess up my eyes! Redness and puffiness can make me look very tired even after getting a good night’s sleep. Allergies can be seasonal or can come from food, mold or dust mites. Pay attention to when your eyes itch or swell -is it after eating certain foods? Is it as soon as you walk into your house? This can help determine or at least, narrow down the cause behind those swollen eyes. It’s no secret that not sleeping enough can wreak havoc with our health and how we look. Going to bed at a different time every night can also affect how well you sleep and feel rested. Combat puffiness by keeping a regular sleeping schedule. 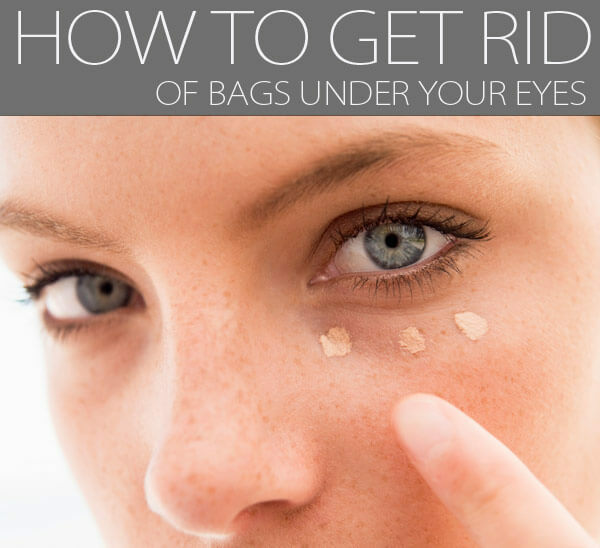 This will not completely get rid of bags under eyes and dark circles, but can significantly improve them. I am talking about regular use of cigarettes and/or alcohol. 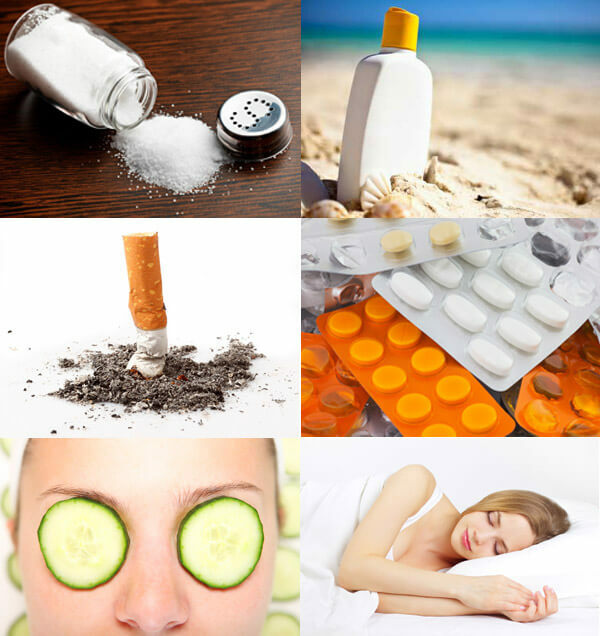 Booze and cigarettes dehydrate the skin which weakens the delicate areas around your eyes. Cigarettes also damage skin cells and break down your skin’s natural elasticity (collagen). Long term use of either or both can create a sunken, tired look. Moderation is key. And if you do decide to go all out and have an all-nighter, drink plenty of water to minimize the damage. You must have seen this one coming – aren’t UV rays a major culprit with any skin related issues! Too much sun exposure can cause the skin around your eyes to wrinkle and sag. Long-term exposure to sunlight will eventually permanently damage those areas (which is 10 times thinner than the skin on your face), so take the extra time to care for them! Eat less salt. Lower your salt intake to retain less water. Use sunscreen + wear sunglasses. Slightly elevate your head when you are sleeping. This helps drain any fluid that could accumulate around the eyes due to gravity. Drink alcohol moderately and cut down on smoking (or quit entirely). Use allergy medications and rinse your sinuses with a Neti Pot. Use concealer or other cosmetics aimed at covering swelling and dark circles. Use eye cream containing caffeine, vitamin K, A or C and apply under the eyes as well as on your eyelids. Use cool compresses, cucumber slices, a bag of frozen peas or frozen spoons to bring down the puffiness. For spoons; take two metal spoons and leave them in the freezer for about 10 minutes. Take them out and gently roll the back of the spoons against your eyes (I do top and bottom) until the spoons are warm. Repeat if you need to or finish with eye cream. Caffeinated beverages act as a diuretic, which aid in relieving water retention – a major cause for puffy eyes. Get double the usage out of your tea bags; steep them, drink them and wear them on your eyes! A vitamin K deficiency could also be at the root of your problem. Up your intake of kale, scallions, Brussels sprouts, asparagus, chili powder and leeks to reduce swelling and dark circles. Red meat, liver, seafood, poultry, beans, spinach, tofu (around 3 ounces per serving). Iron deficiency is another cause for dark circles and puffiness. There are two dietary forms of iron : Heme and Nonheme. Heme iron can be found in meat, seafood and poultry and absorbs fairly easily through your digestive tract. Nonheme iron is mostly found in plants, legumes and iron-fortified foods, and gets absorbed less easily. Nonheme iron is best absorbed with vitamin C so next time you make yourself a salad, add some grapefruit, a few slices of orange, or a handful of broccoli florets for maximum absorption. – Look for eye creams with caffeine, vitamin K, A and C.
Sometimes a concealer just isn’t enough. Here are other tricks I have learned through my 20 years of modeling watching expert makeup artists work their magic on my tired eyes. Hydrate before using a concealer. Use a softener and mix a little serum with your eye cream before beginning your application. These steps will protect the delicate skin around your eyes, hydrate it and soothe it as well. Makeup artists who specialize in beauty will spend lots of time hydrating the skin before applying any makeup – I saw it first hand on set when shooting for Lancome, Boots No7 and RMK (Kanebo) Cosmetics. Use a concealer that is YELLOW or PEACH. These colors neutralize the purple-blue color of dark circles. Pick one shade darker than you would normally wear and blend using your fingers for a more natural look. Recommended by The Beauty Department: Benefit Erase Paste is a brightening camouflage for the eyes and face, and comes in three shades. Finish with an HD loose powder. Avoid looking cakey under the eyes as this would attract more attention to the problem areas. 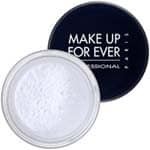 HD powders are the finest loose powders on the market and are now the standard makeup finish for TV and film. In Style Magazine Winner for best powder five years in a row and a favorite of mine. Focus more attention on the upper eyelid. Apply liner and a couple of coats of mascara to the upper lids. Leave the under-eye parts bare. Or you can highlight the corners of the eyes with a little white eyeshadow to open up the eyes. face. In addition, I have heard about Vitamin E which helps a lot. I had an eyebag removal in Singapore and the result was amazing. However, I don`t stop applying different face mask because I know that skin care is not a thing that you have to do once it is constant daily care.